On back jacket reads "Put em up! Put em way uuuup!" You know what, we all can forget about Toto! You don't need him walking with you down the yellow brick road. Your focus, and all our collective focus, can now be set on the pressing matters at hand. 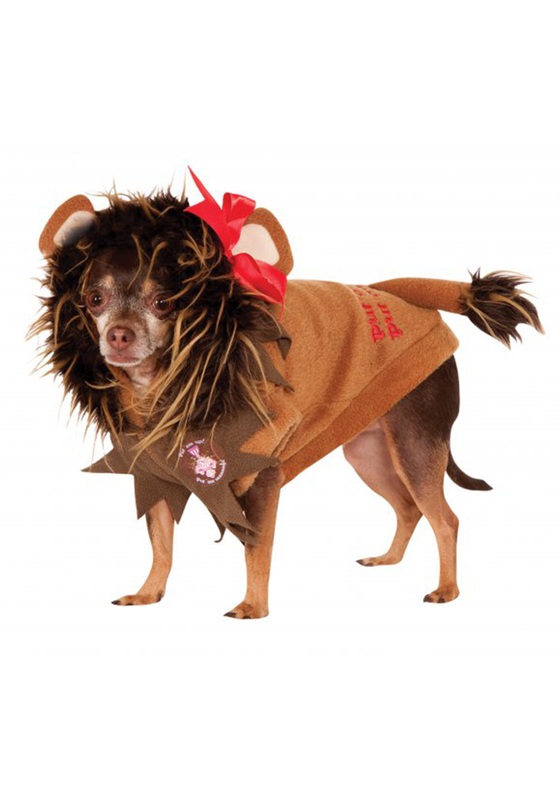 Like, now that you can have your pooch dressed up in this Cowardly Lion Pet Costume, what adventures might you choose to go on? Will you tempt the Wicked Witch? Will you look for others to join your squad and roll up to Oz? If so, what might you ask the almighty Wizard? We bet your pooch wouldn't mind a nice, big bone, or a 32-ounce steak. But, then again, dogs are man's best friend, and you know your canine best. Will you two ask for a gift of courage, and hope it helps keep the larger dogs at bay? Or will you ask (in private, of course) for a little less shedding around the home? These are the important decisions you will have to make before this Cowardly Lion Pet Costume gets to your doorstep, because once it arrives, we all know there will be no stopping the lil' pooch from speeding toward the Yellow Brick Road!